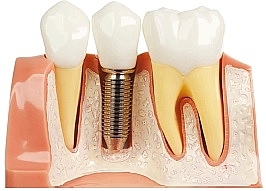 Dental implants are metal anchors that act like your tooth’s natural root. The implants we use are chemically similar metals utilized in orthopedic surgery. Dr. Adams will surgically place the implant into the jawbone, and once bone has healed against the implant (osseointergration), a small post (abutment) is then attached to the implant which provides stable anchors for artificial replacement teeth (crowns). For our patients, the placement of dental implants involves two critical phases. First, implants are placed within your jawbone. For the first three to six months following surgery, the implants are beneath the surface of the gums gradually bonding with the jawbone. After the jawbone has bonded to the implant, the second phase begins. Dr. Adams will uncover the implants and attach a small healing abutment. After a couple weeks your general dentist will be able to start making your new teeth. First, an impression of your teeth must be taken. After they are sent off to the lab, they will create your final tooth and attach it to a post that can be connected to the implants. Once the lab has finished your finals crown, your general dentist will permanently attach it to your implant.